It’s finally time to spend those long days outside as you enjoy time with family and friends. What better way to do that than with help from a pergola? 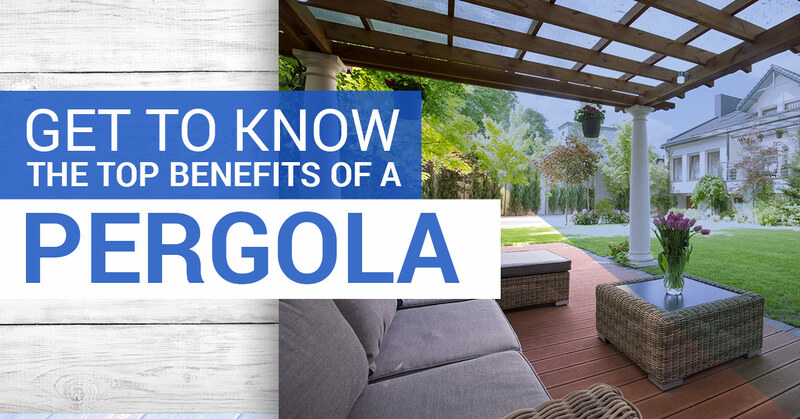 In this blog post, we will explain how a pergola could be the best home addition you’ve thought of in years. Let’s first go over what exactly a pergola is. Also referred to as an arbour, a pergola is a garden feature that forms a shaded walkway, passageway, or sitting area of vertical posts/pillars. Typically, these posts will support cross-beams and a sturdy open lattice, upon which woody vines are trained. Keep in mind that pergola construction makes a great type of gazebo, as an extension of a structure, or to serve as protection for an open terrace or a link between pavilions. Be sure to check out the variety of pergolas completed by our deck builders in the past. They add beauty to a home – A decent percentage of homeowners associate pergolas with awnings. However, the two are very different in reality. Awnings are meant to simply provide shade and that’s about it. Pergolas, meanwhile, boast a unique beauty. As long as you select the right one, pergolas have an aesthetically pleasing sculptural and architectural design. They’re great for plants – Those with a green thumb will appreciate the versatility that a pergola provides. For example, they can lend support to climbing flowers, vines, and ivy. You’ll quickly find that these plants will weave their way up the pergola’s structure and through the beams. It’s a good idea to consider options such as wisteria or clematis with your newly placed pergola. They provide shade – Now you can enjoy the yard even during those hot hours in the afternoon! Consider that the size of the beams/pillars will determine how much shade is provided. Just know that a pergola can never create a fully-shaded space on its own. Pergolas are affordable – Do you want to shore up your backyard but don’t have a lot of money to spend? If so, then a pergola can be the perfect project. They’re relatively inexpensive, but can have a noticeable impact on your yard, especially if you add some climbing flowers or other plants. There’s no doubting that a pergola makes a great investment. They’re easy to install – Your preferred outdoor deck builder should be able to install your new pergola without much hassle. As an added bonus, you won’t have to worry about maintenance or deterioration on your end. From going over pergolas to pool decking options, Ready Decks is here for you. For 16 years, we’ve been the premier source for affordable decks. Unlike other decking companies, Ready Decks strives to provide the highest quality site-built decks in the shortest time possible. At the same time, our deck installer provides homeowners with the greatest value. Don’t just partner with any deck contractor for your pergola project. Instead, choose the professionals who take quality, value, and integrity very seriously. Whether you have questions about our products our want to ask about financing options, we can help. Call Ready Decks now.